After taking a pounding from tropical depression Vamco and the resulting flooding, Soi Khao Talo now more closely resembles the surface of the moon than an East Pattaya street. Once the water receded Sept. 19, big holes were seen throughout the road from the Boonsamphan Temple curve to railway road. Drivers must use caution while trying to avoid the holes and traffic on the opposite side. 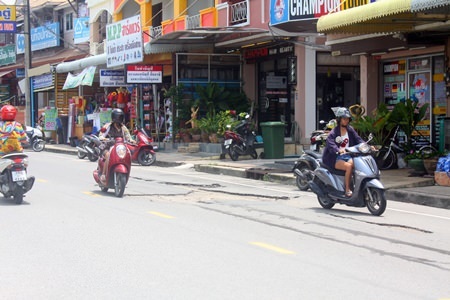 Residents need to be careful on Khao Talo Road, and avoid areas that look more like the surface of the moon than a street. 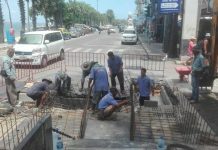 Soi Khao Talo recently had been resurfaced and residents say the rain shows the lack of quality that went into the job. Some of the holes showed that the concrete was very thin.